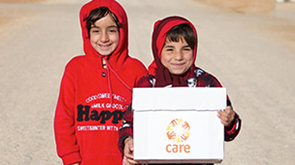 Explore the stories of CARE packages sent to British people after World War 2 – and the real help CARE sends to people in need across the world today. Read the memories and see the photos of people who received CARE packages after World War 2. Read stories from people who remember receiving CARE packages after World War 2. Sending CARE packages was what CARE was first set up to do. Visit our interactive Then and Now website to explore what CARE meant after World War 2 – and what CARE means to people in need around the world today.